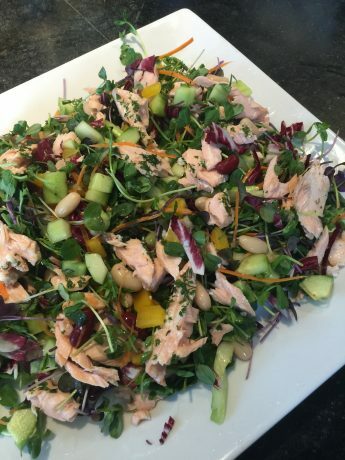 In this new yummy salad, roasted and cooled salmon is gently mixed with a platter of pea shoots, sliced cucumber, diced avocado, white beans and slivered red cabbage. The dressing is a simple lemon herb vinaigrette. The platter looks beautiful and makes the perfect lunch or dinner for company. Don't miss making this one! Preheat oven to 400 degrees. Line a rimmed cookie sheet with parchment paper (if you have it) and place salmon on top. Sprinkle with salt and a film of olive oil. Depending on thickness, bake for 18-20 minutes, or until cooked through, and then cooled. When cooled, remove any skin and dark parts underneath, and break gently into chunks. Place the pea shoots in a large, wide bowl or platter, with enough room to show off the toppings. Gently mix in the white beans, red cabbage or radicchio, yellow pepper, cucumber, carrot, and red onion. Make the dressing by whisking together the lemon juice, honey, Dijon garlic, herbs, olive oil, salt and pepper in a mason jar. Pass the dressing at the table and let each guest spoon or pour on their own. Shake well. Just before serving, gently mix the salmon into the salad. Top with the diced avocado.